A visitor at the pension fund in Simferopol. Photo: Alexei Malgavko / RIA Novosti. All rights reserved.Even as the Russian Federation continues to pursue military aggression in Eastern Ukraine, Ukraine’s Pension Fund is engaging in intensive communications with its counterpart body in Russia in order to establish whether Crimean residents who have applied for a pension in Ukraine are also receiving one in the occupied territory. Following the forcible annexation of Crimea in March 2014, a certain percentage of the peninsula’s inhabitants left their homes and relocated to mainland Ukraine, with some departing immediately and others some time later. Given that pensioners also had to leave Crimea, the payment of pensions became an issue. According to Ukrainian legislation, pensioners departing the temporarily occupied territories of Ukraine (parts of Donetsk and Luhansk regions, Crimea) and the zone of hostilities in the Donbas have the right to receive pensions in their new place of settlement throughout the rest of Ukraine. Pension payments for internally displaced persons (IDPs) from the Donbas were commenced almost immediately – back in 2015, in fact. But the Ukrainian Pension Fund altered the procedure for the granting of pensions to displaced persons from Crimea, acting in disregard of current legislation and doing so on its own initiative. A “rule” concocted by the Pension Fund dictates that a pensioner displaced from Crimea can only be granted a pension once an official inquiry has been sent to the Russian Federation to ascertain whether said pensioner received a pension in Russia while living in occupied Crimea. Officials in Moscow scrutinise documents in detail before putting together a response for Kyiv. If it transpires that the Russian Federation has been paying out a pension to a given person, the Ukrainian Pension Fund refuses to issue one. “Fair enough!” one might say. “Two pensions – one from Russia, one from Ukraine? That really is a bit much, isn’t it?” But this brand of “fairness”, arbitrarily instituted by Ukrainian officials, can end up having serious consequences for Ukrainian citizens. To say nothing of the fact that actions of this ilk represent a gross violation of human rights. Sending official inquiries to the occupying authorities in Crimea is forbidden by Ukrainian law. Indeed, there is no postal service from Ukraine to Crimea. And this is why the Pension Fund resorts to subterfuge. Inquiries are sent to Moscow, Voronezh and Krasnodar region, from where they are redirected to Crimea by the Russian Federation’s Pension Fund. It’s noteworthy that the payment documents which the Ukrainian Pension Fund uses as a basis to refuse pensions are invariably issued by the Pension Fund in the so-called “Republic of Crimea” – and this despite the fact that all documentation issued by the occupation authorities has been recognised as void by Ukrainian legislation. 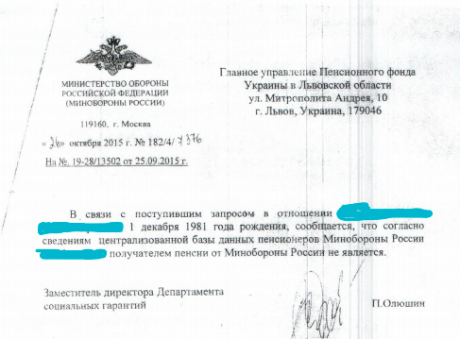 The documents are then sent back the way they came: from annexed Crimea to Moscow and then to Ukraine. The responses sent by the Russian Pension Fund to its Ukrainian counterpart are very vague, specifying only whether or not a pension has been awarded. And since the Russian Pension Fund provides no primary financial documentation (namely, payment receipts), it ultimately remains unclear whether or not a given resident of Crimea has ever actually received a pension from the Russian Federation. “Awarded” doesn’t mean “paid”. After the so-called “accession” of Crimea into the Russian Federation, the Russian authorities needed to resolve the peninsula’s pensions issue, and to do so quickly. They didn’t spend a long time delving into the details: rather, they simply awarded the same amount multiplied by two (the rouble equivalent of the hryvnia figure). The money was awarded even if the individual had left Crimea. The whole absurdity of this situation manifested itself when pension awards were made to people who had passed away. The relatives of a late Crimean resident, whose case was handled by lawyers from the Ukrainian Helsinki Human Rights Union, appealed to the Ukrainian Pension Fund and requested that it pay out an as yet unreceived installment of her pension for the period when she was still alive and residing in mainland Ukraine. It turned out, according to information from Russia’s Pension Fund, that the woman was awarded pension payments for two years after her departure from Crimea, and for eight months after her actual death. The Ukrainian Pension Fund fails to question the information received from its Russian counterpart – which, to put it mildly, is rather strange, given that Ukraine and Russia are in a de facto state of war. 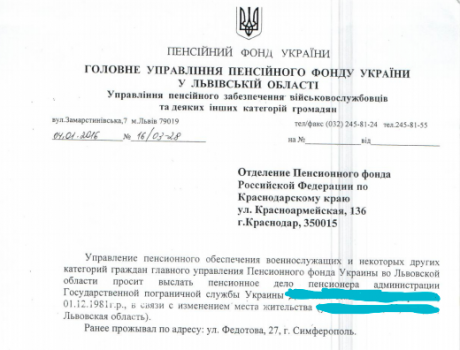 When it sends an inquiry to Russia, the Ukrainian Pension Fund specifies the current address of the pensioner who has relocated from Crimea to Ukraine; in effect, then, it officially informs the occupying country about a particular resident’s departure from Crimea to Ukrainian-controlled territory. The pensioner’s personal information is sent to Russia without their consent. Why this is done remains unclear: the pensioner’s mainland address doesn’t need to be specified to obtain the relevant information from Russia, and doing so represents a gross incursion into a citizen’s private life. Request to the pension fund from the Ukrainian side. Material is provided by the author. According to Anna Rassamakhina, a lawyer for the Ukrainian Helsinki Human Rights Union who regularly represents the interests of displaced Crimeans in Ukrainian courts, the Ukrainian authorities have (as of December 2017) handed over the personal data of 2,700 Crimean residents – all of them citizens of Ukraine – to their Russian counterparts; the fact of the residents’ displacement is communicated to the Russians together with a notification of their new address. Some of the displaced Crimean pensioners are also Anti-Terrorist Operation (ATO) veterans. And so arises the question: why is people’s personal data being handed over to third parties without their knowledge or consent? It’s hard to believe that the Ukrainian Pension Fund is unaware that its actions are, at the very least, in violation of Ukraine’s personal data protection law. Or are we dealing with simple negligence here? Over the course of several years (from 2015 to July 2017), officials did their best to pretend that there was really nothing out of the ordinary about handing over the personal information of displaced Crimean residents, some of them ATO soldiers, to an aggressor country. Things began to change slightly only after Pavlo Dovbush, a displaced Crimean and a member of the Aidar volunteer battalion, enlisted the help of lawyers from the Ukrainian Helsinki Human Rights Union to bring legal action against Oksana Syvch, the head of the office of pensions provision for military personnel and certain other categories of citizens at the Lviv branch of the Pension Fund. The action was brought because personal data had been unlawfully disclosed and handed over to the FSB, the Ministry of Internal Affairs and the Ministry of Defence of the Russian Federation. Dovbush won the first-instance trial, and an administrative fine was imposed on Oksana Sivch. The appellate court revoked this ruling, however. But in July 2017 the leadership of the Pension Fund in Kyiv, fearful of a public outcry, instructed that the current Ukrainian addresses of pensioners from Crimea must not be specified. And here’s another interesting nuance: the declarations pensioners are made to sign by Ukrainian Pension Fund officials feature requests to transfer their pension files from the Pension Fund of the Autonomous Republic of Crimea. The applicants are told that their files will be transferred from the Crimea to Ukraine, yet no mention is made of the fact that said files will be processed by the Pension Fund of the Russian Federation – which already constitutes a deliberate deception on the part of the Ukrainian authorities. Does the Pension Fund recognise the annexation? To find out how the Ukrainian Pension Fund rationalises its position, and why it is engaging in communications with its Russian counterpart, I sent an information request to Elena Okhrimenko, deputy director of the Pensions Department. On 8 May, 2018 I received a response from Irina Kovpashko, the deputy chair of the Pension Fund board, in which the Fund’s actions are justified with reference to the pension provision agreement that currently exists between countries in the Commonwealth of Independent States (CIS). This agreement stipulates that if a pensioner relocates from one CIS country to another, the pension can only be paid out by one of the countries in question. Does it follow, then, that Crimea – officially recognised by Ukraine as temporarily occupied Ukrainian territory (as per the “Law on Ensuring the Rights and Freedoms of Citizens and the Legal Regime on the Temporarily Occupied Territory of Ukraine”) – is, in the eyes of the Pension Fund, now another country, that is, a constituent part of Russia? If so, the Pension Fund of Ukraine de-facto recognises Russian jurisdiction in Crimea. The Pension Fund also cites Resolution No. 234 of Ukraine’s Cabinet of Ministers, which supposedly authorises the sending of inquiries to Russia. Once again, however, it is guilty of prevarication: as Anna Rassamakhina notes, the resolution doesn’t apply to displaced persons from Crimea. Which means that the aforementioned procedure of sending pension calculation inquiries to Russia is provided for neither by Ukrainian legislation, nor international instruments. Rather, it is the result of a decision arbitrarily taken by the Pension Fund of Ukraine. Some of the displaced Crimean pensioners have asserted their rights in court: the actions of the Ukrainian Pension Fund have been declared illegal by the Shevchenko and Podil District Courts in Kyiv, as well as the Busk District Court in Lviv region. In and of themselves, however, these positive rulings have failed to solve the problem. As UHHRU lawyers (who are alone in taking such cases on) assert, most of the rulings aren’t actually executed – Kyiv prohibits the Pension Fund authorities from executing them on the ground. In addition, not all pensioners can afford to go to court: the average monthly pension in Ukraine is around €70. Though Ukrainian pensioners do prevail in the majority of cases fought against the Pension Fund, a systematic solution to the problem is a different matter entirely. Because precedent law does not exist in Ukraine, older displaced persons are forced to defend their rights through the courts on an individual basis. A few possess the requisite energy, knowledge and resources to muster a legal challenge; the majority, however, do not. Correspondence between the Pension Fund of Ukraine and the Russian authorities. Material is provided by the author. In the main, pensioners are not aware that the truth is on their side. After all, Ukrainian Pension Fund officials threaten to hold them criminally liable for being in receipt of two pensions simultaneously. Here’s a typical example, as provided by Anna Rassamakhina. A Crimean resident relocated to mainland Ukraine and appealed to the Pension Fund to resume her pension payments, only to be told that her paper file must first be requested from Russia. The pensioner’s file was never located, and she ended up travelling to Russia to find it herself. Since Ukrainian officials were constantly looking for pretexts not to award the woman a pension in Ukraine, there was no option left to her, now exhausted and browbeaten, but to formalise the pension in Russia. The solution to this problem must be a systemic, structural one. 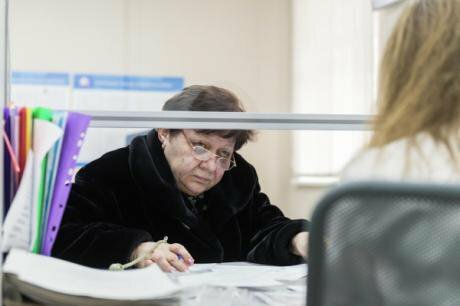 To obtain information about the pensioners’ work histories – pensioners from Crimea included – the Ukrainian Pension Fund doesn’t necessarily have to send inquiries to Russia. There’s an alternative means of doing so, and one enshrined in Resolutions Nos. 365 and 637 of the Ukrainian government. These resolutions stipulate that pensions payments to displaced persons can be resumed in accordance with data from a digital pension file (as opposed to a paper one) containing the full gamut of information essential for calculating pensions payments. The Pension Fund is authorised to request such a file from the Computing Centre of the Ukrainian Ministry of Social Policy of Ukraine. All the necessary mechanisms exist, then, and they’re legislatively enshrined – but fail to work in practice, and the Ukrainian Pension Fund continues to abuse power and violate the law. Ukraine has been unable to guarantee sovereignty and territorial integrity for its citizens. The Ukrainian state cannot therefore refuse to pay out pensions simply because certain residents have found themselves in occupied territory and have been forced to live under conditions imposed upon them by the occupying country. According to Anna Rassamakhina, the Pension Fund’s actions are primarily motivated by the desire to save budget funds. This state of affairs epitomises the totalitarian-style thinking and approach of the Fund’s officials, not least because the amounts involved are almost laughable: approximately €70 in Ukraine, €120 euros in occupied Crimea (as paid out by Russia). According to Crimean pensioners, meanwhile, the Pension Fund of the Russian Federation suspends payments on the peninsula the moment it learns from its Ukrainian counterpart that a given pensioner is receiving a pension in Ukraine. It would appear that the Pension Fund in Crimea is just as paranoiacally afraid of the possibility of Crimeans receiving two pensions at the same time. Ukraine will be able to assert with confidence that it has moved beyond totalitarian-style thinking only when its officials respond to Russian inquiries regarding Crimeans in receipt of pensions in mainland Ukraine by declaring that they’ve no business communicating confidential information to a country that has illegally occupied Crimea. For the time being, however, Ukraine continues to sell off its sovereignty – and to betray its own citizens for peanuts.